The Society is delighted to have received this stunning “Arrow Vase” on loan from the Horniman Museum. The loan is made possible thanks to the “Object in Focus” programme, supported by the Horniman and Arts Council England. This Ming-Dynasty vase would have been used in the game of touhu, in which the aim was for players to throw arrows into a wine vessel. 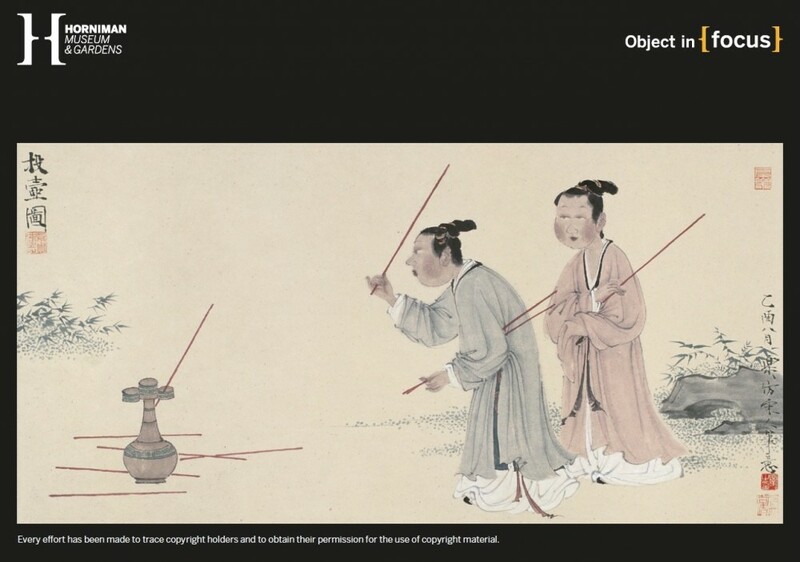 It is an ancient game (which may have begun as a drinking game), dating back at least to the Chinese Warring States period (5th-3rd century BC), when it was described in the Li Ji (Book of Rites). Its popularity endured for much of the next 2000 years, with a particular vogue in the early part of the Ming dynasty (1368–1644). The Li Ji gives some details of how the game used to be played: the vase would be filled with small beans, to help stop the arrows from bouncing out. Mats were placed to indicate where the players were to throw from, two and a half arrows’ length away from the vase. The arrows were made of mulberry wood, or from a type of buckthorn. Players took it in turns to throw a set of arrows. An elaborate system of counters was used to keep track of how many throws each player had made, and how many were successful. There were several rounds. At the end the “superintendent of archery” would tally up who was the winner. The contest was accompanied by a group of musicians playing a tune called “The Fox’s Head” on stringed instruments. 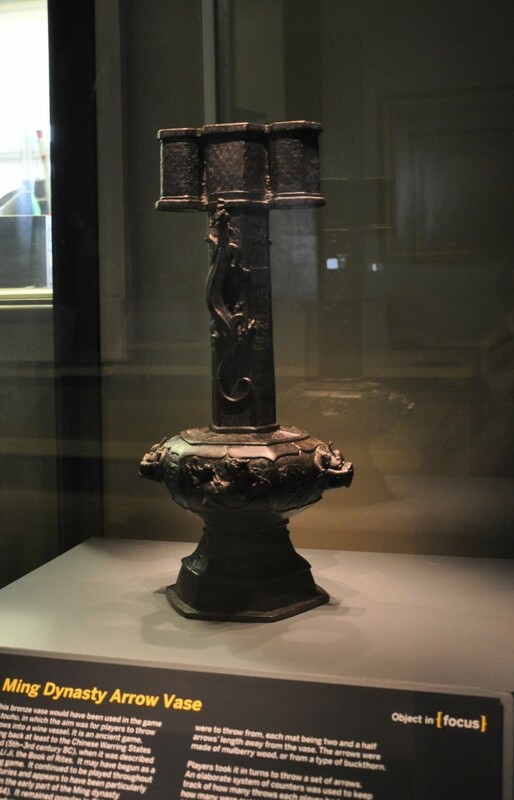 By the 12th century the game had spread to Korea, where it is still played today, though with a rather less elaborate vase. The Arrow Vase is on display in the Society’s Reading Room until 14 December 2018, where it can be viewed during our Library opening hours (Tuesday and Friday 10am-5pm, and Thursday 2pm-5pm). It may also be viewed outside our opening hours, by appointment: please contact us for more information. We are very excited about the forthcoming lecture, held in connection with the loan, on Tuesday, 18 September, at 6.30pm. The lecture – “Arrow Vase: from ritual to game” – will see Dr Rose Kerr (former Keeper of the East Asian Department at the Victoria and Albert Museum) discuss the object’s history and context. All are welcome and we hope you will join us for a fascinating occasion. Next week will also see an event on Thursday, 20 September, at 6.30pm, when Dr Gulfishan Khan will lecture on “The Indo-Persian Elite and the Formation of Orientalist Tradition”. As these events indicate, the Society’s 2018-2019 programme is now underway, with the first event taking place last Wednesday, 12 September. This saw a screening of the documentary film, Saragarhi: The True Story. We are grateful to Captain Jay Singh-Sohal for presenting the film, and to all who attended.